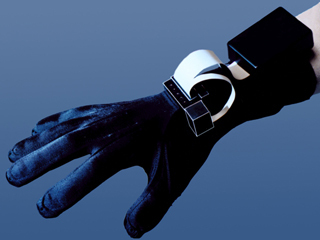 The 5DT Data Glove 5 measures finger flexure (1 sensor per finger) and the orientation (pitch and roll) of the user's hand. It can emulate a mouse and can be used as a baseless joystick. The system interfaces with the computer via a cable to the serial port (RS 232 - platform independent). It features 8-bit flexure resolution, extreme comfort, low drift and an open architecture. The 5DT Data Glove 5-W is the wireless (untethered) version of the 5DT Data Glove 5. The wireless system interfaces with the computer via a radio link (up to 20m distance) on the serial port (RS 232). Move easily through your virtual world by combining hand gestures with the pitch and roll of your hand. Breakthrough pricing, new features, open architecture and software support have made it the glove of choice. Wireless version available Support for VR world building programs including Themekit VREK, Superscape VRT and Sense8.